Three Bedford FIRST Lego League teams, the Mindstorms Mayhem, the Munchkins and the McKelvie DarkSeerS, took this year’s theme “No Limits” to the extreme and earned top awards at the New Hampshire State Tournament on Saturday, Dec. 11, at Nashua High School North. The teams competed against 46 other teams to build and program a robot to solve nine missions through research, problem solving and teamwork. The robot had to complete tasks that a disabled person or student might encounter, such as move a CD to a desk, put a ball in a basket, serve a tray of food, feed pets, open a gate, read the correct colored bus sign, push in chairs, bring a pair of glasses back to base and end with the robot on the top of some stairs. 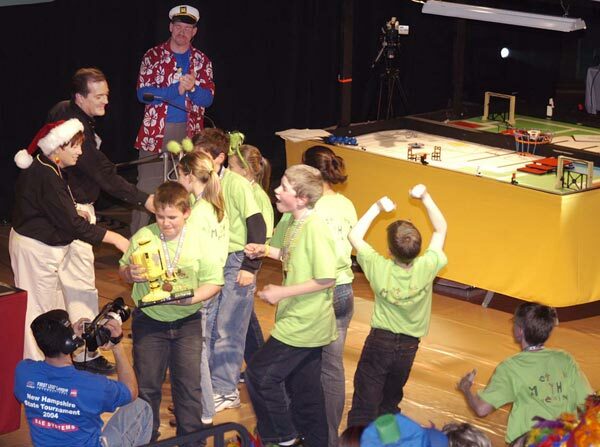 Mindstorms Mayhem is a team of homeschoolers from Bedford, Milford, Merrimack, Wilton, Hollis and Lyndeborough. The Munchkins are a four-student neighborhood team from Bedford, including Kevin Walch, Adam Spierer, Roxanne Harmon and Stephanie Schaeberle. The DarkSeerS are a team of 10 students from McKelvie Middle School. During the Dec. 11 competition, the teams competed in three preliminary rounds with their robots, followed by the playoffs for the eight top scoring teams. Teams were also judged on robot design, robot performance, research and teamwork. Mindstorms Mayhem placed first in robot performance and earned the prestigious Director’s Award for top honors across all judging categories. The team will represent New Hampshire at the international competition held in conjunction with the US FIRST Robotics Championship in Atlanta in the spring. The Munchkins received the second-place Robust Programming Award for their exceptionally reliable programming, which automatically follows walls and lines. This was the second consecutive year that the team was recognized at the New Hampshire finals with a programming award. “The greatest challenge of the competition was to stay calm under pressure to operate our robot and when we did, the robot did the all challenges very well.” said Kevin Walch of the Munchkins team. The McKelvie DarkSeerS were awarded the second-place Innovative Solution Award for their work on the research project. In November, the Dark-Seers also won a Director’s Award at the state qualification tournament. Mindstorms Mayhem, one of several teams sponsored by BAE Systems, had been meeting several times each week since mid-September brainstorming and building in a teammate’s basement. As this was the team’s third year in the competition, the students had to write their own programs, problem-solve and design a robot that could solve the year’s challenges. The robot had a time limit two minutes, 30 seconds to complete the tasks. “Learning much about programming gave us some knowledge that we could use in the future to develop new technologies specifically for disabled people,” said Walch. In addition to robot design, each team presented a research project to a panel of judges. ‘We focused on social issues, specifically general awareness towards people with disability in public places such as Wal-Mart,” said Munchkins member Stephanie Schaeberle. Mindstorms Mayhem partnered with the Milford Wadleigh Memorial Library Trustees to help make the library more accessible to people with disabilities. The team developed and distributed a brochure and instruction sheets for some software programs installed on the library computer that make using the computer easier for people who are visually impaired. The DarkSeerS researched throughout McKelvie Middle School to find obstacles to attending the school for a student with a disability. To understand the challenges faced by a disabled student, they traveled around the school in a wheelchair, wore vaseline-covered glasses to simulate a visual impairment, and taped together their fingers to model a physical disability. Their project presentation included suggestions to make McKelvie more accessible to a student with disabilities. Included in the competition this year was a pilot program for children aged 6 to 9. In the Junior FLLprogram, teams of up to five students had to build a LEGO model of a building, identify inacessibilities, make a wind-up LEGO car and assemble what they learned in a “show-me-sheet.” Mini Mayhem, younger siblings of Mindstorms Mayhem formed a team. For more information on US FIRST and FIRST Lego League, visit www.usfirst.org.